Due to its countless plants und fruits, nature has an inexhaustible source of valuable substances beneficial to health. No matter if it is pomegranate, olive leaf, schisandra or grape seeds: Each plant has its own ingredients, which are able to promote well-being. In plant extracts, those substances are isolated. Because many plant extracts are sensitive to light, moisture and heat, the presentation in capsule form has been proven to be a perfect solution to this problem. It ensures an optimal quality and stability of the used extracts. 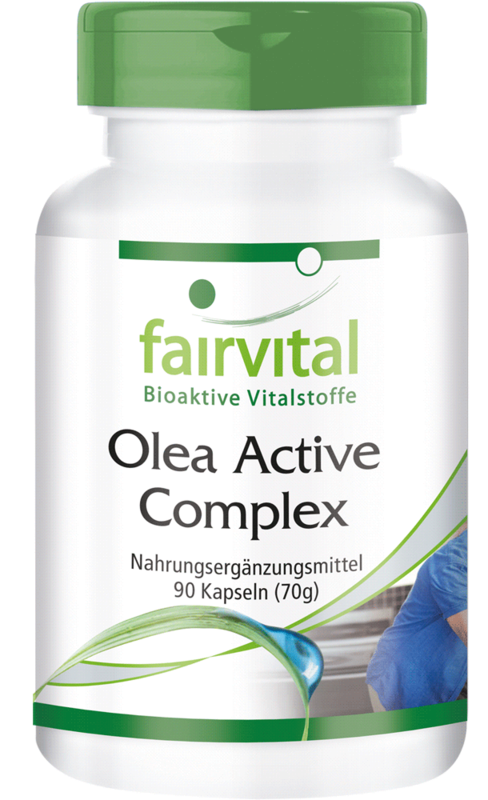 The plant extracts contained in Olea Active Complex are standardised. The olive leaf extract is standardised to 20% oleuropein, the schisandra extract to 9% schisandrin, the grape seed extract to 95% OPC and the pomegranate extract to 40% ellagic acid. A vitamin B complex completes the plant extracts in these capsules by Fairvital. Adults 1 capsule daily in the morning and 1 capsule at noon with plenty of water.